Use the power of sunlight to produce rich blue prints of common objects on paper or fabric. 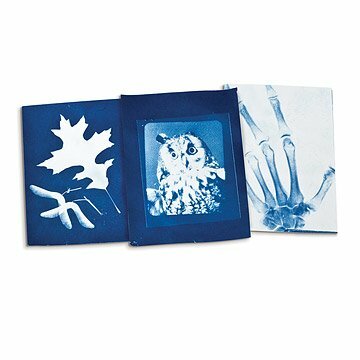 Based on the cyanotype process pioneered by Anna Atkins (the first female photographer) in 1842, Sunography is a fun and rewarding introduction to printmaking, using a minimum of equipment and materials. Place any object or transparency on the Sunography paper, expose to sunlight, and rinse with water to produce your own richly blue prints. Use old photo negatives, x-rays, bits of lace, leaves, and everyday objects to compose an endless variety of images. The heavyweight cotton paper or fabric may be exposed on both sides, and is suitable for hand coloring, painting, or stitching to make your prints even more unique. Made in the USA. Paper Kit includes: 6 5" x 7" sheets of photosensitive paper (each printable on both sides), instructions, light proof plastic storage bag. Fabric Kit includes: 6 6" x 6" sheets of photosensitive cotton fabric (one each of green, orange, rose, turquoise, violet, and white)(each printable on both sides), instructions, light proof plastic storage bag. A unique Christmas gift for my photography loving niece! She was ecstatic upon opening it! My only qualm is the directions we're vague and a little difficult to figure out. Got this for my father in law for Christmas. He loved it! I got this for my mom for Christmas since she likes crafty stuff. She liked it but I thought the packaging and overall presentation of it was a little underwhelming. "I can't wait to try this." My step-daughter is an "artsy" type person, who loves taking pictures of the outdoors (flowers, clouds, etc.) When she opened this she said, "So, cool! I can't wait to try this out and see how it works!" Super fun for kids and adults! So much fun and easy to do. I was looking for a gift for my grandson that was different and intresting to do. I wanted something that would challenge his creativity and this was perfect! I got this for a gift and I really like the idea. She was thrilled and is excited to try it out. Definitely a great gift idea for the creative!